On top of the excellent selection of products we offer, we pride ourselves we take great pride in being able to offer American Steel Carports! It is another example of the high standards of quality and customer service that have helped build our reputation. When you buy a steel storage building from Aarons Tree & Landscaping Services, LLC., you can always rest assured that it is engineered certified to meet your state codes and has been reinforced to withstand high winds and large amounts of weight. And the commercial finish that we place on the exterior means that the building requires low maintenance to keep the structure looking nice for years. If you order a product from our company, a few other perks that accompany it are that we only sell engineered certified steel structures plus provide free shipping and installation. With these services included in the deal you won’t have to worry about transportation issues or construction. After all, this is our specialty and we are more than happy to provide these services for our valued customers. Remember, we cover thousands of square feet every year with metal carports, garages, horse barns and other outdoor covers. These buildings will last for years, so we know you need a company who will be there for you, who will support the product you purchased and who will stand behind it. That’s what sets Aarons Tree and Landscaping Services apart from the rest and makes us the best provider in the industry. For more information on our products and service, contact us directly. All of our Carports are Engineer Certified. All American Steel Carports are Engineered Certified to meet your state and local codes. Any other requirements such as “extra snow load baring weight and wind load resistance” can be met with Engineer Certification *upon customers request* customized buildings are always welcomed. Being the leading previder and manufacturer of prefabricated steel buildings and carports, we have the expertise in providing turnkey Steel Building solutions to our clients. 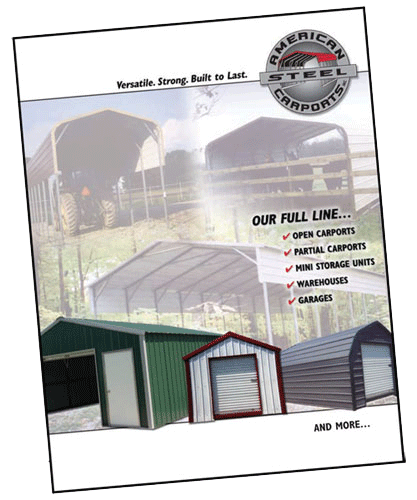 Let our team of experts SELL, ENGINEER,MANUFATURE,SCHEDULE, then INSTALL your Steel Building or Carport. Please feel free to contact us if you have any questions or concerns regarding any service or items we provide!